A stop in Tyumen provides an interesting glimpse into how modern Russia’s oil revenue has influenced Siberia’s oldest Russian city. There’s something different about Tyumen. This city of over half a million people was the first Russian settlement in Siberia. Today, it’s the capital of the vast Tyumen Oblast, or province, that stretches from the Kazakhstan border north to the Arctic Ocean. Tyumen Oblast is home to the majority of Russia’s seemingly limitless oil and natural gas reserves. Some of the world’s largest drilling companies have officers here, and Tyumen residents enjoy much higher incomes than elsewhere in Russia. The result is a cosmopolitan city with a bright outlook on the future. A stop in Tyumen provides an interesting glimpse into how modern Russia’s oil revenue has influenced Siberia’s oldest Russian city. Tyumen is a great stopover point on the Trans-Siberian Railroad and a short ride from Yekaterinburg (five hours) or Tobolsk (four hours). Direct flights run each day between Tyumen and Moscow or St. Petersburg ($450 roundtrip). Tyumen is also located on the Trans-Siberian Railroad. Trains leave Moscow in the afternoon and evening ($110-250, 32-38 hours). In the 16th century, Russia started expanding eastward into parts of Central Asia ruled by the Tatars, an Islamic people who still live thoughout Russia. A band of Cossacks wrested control of Tyumen from the Tatars in 1580. Six years later, Russians established a fort in Tyumen on the Tura River. For centuries, Tyumen vied with the nearby city of Tobolsk—once the official capital of Siberia—for the prestige of the region’s most important city. Tyumen won in the end, when the Trans-Siberian Railroad bypassed Tobolsk and was routed through this now oil-rich city. Tyumen played an important role in Russian history during times of war. At the beginning of the Russian Civil War, the Bolshevik Red Army slowly pushed the White Army, commanded by Admiral Alexander Kolchak, into Siberia. Kolchak and his anti-Bolshevik forces holed up in Tyumen until the Red Army overtook them in January of 1918. During the Second World War, many Russian industries were moved away from the front to Siberian cities. Tyumen had already become an industrial capital during the early Soviet era, and the city became an ideal spot to relocate Russia’s western factories. As Nazi forces approached Russia in 1941, the embalmed body of Vladimir Lenin was sent from the Lenin Mausoleum in Moscow’s Red Square by train to the Tyumen State Agricultural Academy for safekeeping. In 1945, Lenin’s body was shipped back to Moscow. Located in a stunningly remodeled Soviet building, The Hotel Vostok offers modern rooms ($80-125). Far more luxurious—and twice as expensive—is The Hotel Tyumen. Some of the factories relocated to Tyumen during wartime remained in the city. The discovery of oil in the region catapulted Siberia’s oldest Russian settlement to further prosperity. Modern Tyumen is a vibrant city with a number of universities and a revamped center well-suited for exploration by foot. Start your walking tour around central Tyumen on Ulitsa Respubliki. The city’s main drag has fine pedestrian walkways and leads wanderers past an impressive collection of tsarist-era buildings that recall Tyumen’s importance in the beginning of Russia’s colonization of Siberia. From the southeastern end of Ul. Respubliki, head north toward the Tura River and take a brief side trip onto Ul. Ordzhonikidze to visit the Fine Arts Museum (47 Ul. Ordzhonikidze) which houses exhibits of classical Russian and Soviet art as well as traditional bone carving and works produced by the native people who live in the far north of Tyumen Oblast. Back on Ul. Respubliki, you’ll soon see the city’s requisite Lenin statue by the local government buildings. A block away, opposite Lenin, is Tyumen’s city park, a delightful place to walk or hop on one of its amusement rides. Most Siberian cities developed under the watchful eyes of the atheist Soviet regime and churches are usually not Siberia’s strongpoint. But this isn’t true in four-centuries-old Tyumen. Strolling up Ul. Respubliki, you’ll soon come to the Church of the Saviour (41 Ul. Lenina) and the Znamensky Cathedral (13 Ul. Semakova). Each of these stunning Baroque-influenced churches are located right off Ul. Respubliki and were built in the late 18th century. Tyumen is also famous for its historic wooden houses. Heading further up Ul. Respubliki, stop to wander around some of the side streets and snap photos of these ornate wooden structures which provide a glimpse back in time. Near the Tura River, you’ll pass a civil war monument in remembrance of the Tyumen natives who died fighting the White Army and the Tyumen State Agricultural Academy (7 Ul. Respubliki) an impressive building in its own right where Lenin was stored during the Second World War. Near the end of Ul. 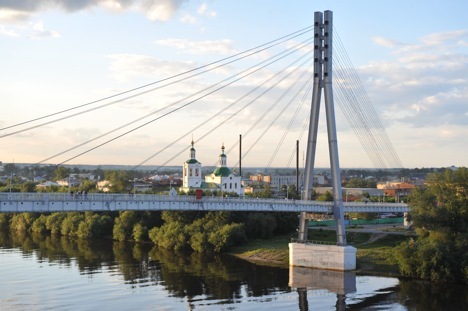 Respubliki, take a walk over the Tura River on the Lover’s Bridge, a suspension bridge open to foot traffic only that has become one of Tyumen’s iconic sights. The other side of the river is a great place to see more of Tyumen’s signature wooden houses as well as take in the churches scattered around the city center. Save the best for last and visit the Trinity Monastery (10 Ul. Kommunisticheskaya) at the end of Ul. Respubliki. A white wall surrounds the monastery, giving it the appearance of a mini-kremlin, and the golden onion domes of the 18th century churches within should not be missed. Although navigating Tyumen is straightforward enough, the St. Petersburg-based travel company OSTWEST can arrange a city tour in Tyumen and the surrounding countryside.